Scientists have known for years that blood vessel loss in the brain impacts cognitive decline as people age. New research from the University of Victoria has provided an explanation for why we lose blood vessels—vital knowledge that could lead to better preventive and protective strategies for maintaining brain health. 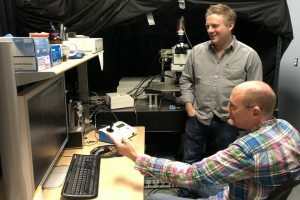 UVic neuroscientist Craig Brown and PhD student Patrick Reeson have been researching the phenomenon of clogged capillaries, the brain’s smallest blood vessels. These tiny capillaries routinely get “stuck,” clogged by cells, fat and debris in the blood. Most clear within seconds to minutes, however some can remain stuck for much longer, but what ultimately happens to these lingering clogs has remained a mystery. To the UVic researchers’ surprise, they discovered that about 30 per cent of these clogged capillaries were pruned from the blood vessel network and never replaced. While the human brain contains millions of capillaries, losing them is obviously a concern when it comes to brain health, says Brown, a researcher in UVic’s Division of Medical Science. Given that he and Reeson saw no evidence in their research of new capillaries springing up to replace clogged ones, Brown notes that identifying preventive and protective measures to hold onto the ones we have is essential. “It will be important to identify new strategies to treat this problem, especially in certain conditions or situations where there is a higher risk of clogged blood vessels in the brain,” says Brown, pointing out that stroke, heart attacks and long periods under anesthesia during surgery are known risks for affecting blood flow in the brain. In this regard, Reeson and Brown found that a vascular growth factor receptor, VEGF-R2, played a crucial role in dictating whether a capillary regained blood flow or became permanently clogged and was pruned. VEGF-R2 is an important protein in the formation of the human circulatory system and regulates the function of blood vessels. Further research into the protein’s role in the pruning process will deepen knowledge and inform future treatment approaches, says Reeson. “Understanding how and why you lose these capillaries is the first step. This is the first time that we’ve been able explain why this loss of blood vessels occurs,” says Reeson. Primary funders for the research are the Canadian Institute for Health Research, Heart and Stroke Foundation and Natural Sciences and Engineering Research Council. The study was published recently in the open-access research journal of eLIFE (DOI:10.7554/eLife.33670), a scientist-led non-profit located in Cambridge, UK.